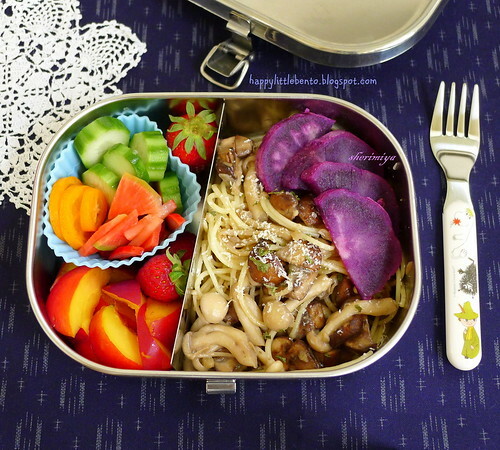 Angel Hair Mushroom Saute Bento, a photo by sherimiya ♥ on Flickr. This one involved cooking, but only very minimally, which made it an easy Monday meal. I sauteed a variety of mushrooms (crimini, beech and enoki) in butter and some olive oil until softened, along with minced shallot and garlic. Salt and peppered to taste, parsleyed, and grated some aged manchego into the pan with the heat turned off. Tossed the cooked angel hair into the pan with the mushroom sauce, and it was done. And the kids gobbled it up! I packed some for MisterMan's bento, topped with some dark-skinned purple sweet potato which I found locally. He also gets the first baby nectarines I've seen at the market this year, baby strawberries, and fresh pickled cukes, kumquats, and watermelon radish. Happy Monday! 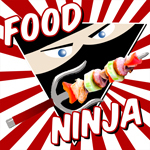 That looks really yummy :).